If you've ever wanted to buy a fading yet still somewhat relevant smartphone specialist, maybe the next Research In Motion (RIMM) owner will be you. The company behind the iconic BlackBerry that many argue kicked off the smartphone revolution is hiring investment bankers JPMorgan and RBC Capital Markets. Their task: to help the Canadian company explore a "strategic review" that may include an outright sale of the company. Oh, if only RIM had smoked out a suitor a couple of quarters ago while it was still on the rise. Things have been rough for smartphone companies outside of Apple's (AAPL) iPhone and those using Google's (GOOG) Android OS. According to IDC's Worldwide Quarterly Mobile Phone Tracker, 82% of the 152.3 million smartphones that shipped during the first three months of this year were either iPhones or Android devices. The two operating systems combined for less than 55% of the market a year earlier. Obviously, the rapid ascent of Android and Apple's iOS had to come at other platforms' expense, and here's where BlackBerry is looking more like a black-and-blue berry. Market watcher IDC claims that the market share for shipped BlackBerry devices has fallen from 13.6% to 6.4% over the past year. Can It Get Any Worse for RIMM? Is Microsoft Going to Be the Next RIMM? RIM didn't just announce Tuesday night that it would be turning to a pair of investment bankers to see if it can increase shareholder value. The beleaguered mobile company warned that it was eyeing an operating loss in its latest quarter. Wall Street was already braced for sharp drops in revenue and profitability, but not a single one of the 43 analysts following the company was forecasting the loss that they will now be getting. RIM also confirmed the layoff rumors that have been building in recent weeks, with its CEO discussing "significant spending reductions and headcount reductions in some areas" while also hiring in areas of growth. The company isn't ready to dish out specifics, but sources tell Reuters that RIM's plan is to ultimately go from 16,500 employees today to 10,000 by early next year. The real question now is who would be open to buying RIM. It's a wounded animal at this point. It's shrinking in relevance and apparently headcount. Google and Apple obviously don't need RIM. They're doing just fine on their own, and a second horse in this race would be a distraction. Microsoft (MSFT) was a rumored buyer in the past. One analyst even argued that the software giant had a standing plan to buy RIM if it went under $50. Well, it went well under $50, $40, $30, and $20. Mr. Softy stayed away. Now that Microsoft is investing heavily in its beefed-up Windows Phone mobile operating system, there's no point in buying yesterday's darling while it's on the way down. RIM will be down to finding suitors among private equity firms, but they're also well aware of the trend. These companies don't buy a company unless they think they can unload it later for more. Does that sound like RIM? 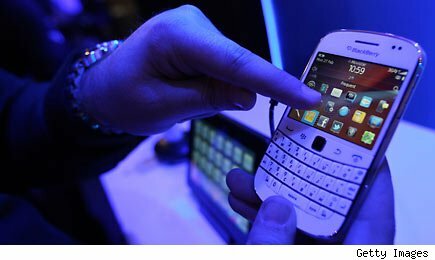 There has always been a healthy base of BlackBerry users, but corporate IT departments that used to demand RIM's secure email-centric devices for security reasons have caved in to popular demand. It's even uglier on the consumer front, where BlackBerry owners are trading in their handsets for iPhones and Androids as soon as their two-year wireless contracts run out. It's not going to get any easier for RIM. The BlackBerry defections will continue, and there is little that a ballyhooed update to its BlackBerry Mobile operating system will accomplish. This "strategic review" may be the next step toward a conditional surrender. Motley Fool contributor Rick Munarriz does not own shares in any stocks in this article. The Motley Fool owns shares of Microsoft, Google, and Apple. Motley Fool newsletter services have recommended buying shares of Microsoft, Apple, and Google. Motley Fool newsletter services have recommended creating a bull call spread positions in Microsoft and Apple.